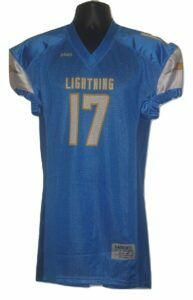 Our semi compression jersey is our number one selling football jersey. We use 4-way stretch poly/lycra for the shoulders, sleeves and side insert pants, and full pin dot mesh body panels on the front and back. Team name, logo, player names and numbers are all included in the base price.